This is another Extra Detail Magnification (or "EDM", for short) obtained from the simply beautiful picture published two days ago (which is, in fact, an Image-Mosaic of several frames obtained by the NASA - Dawn Spacecraft) that shows us some of the (secondary and) so-far unexplainable (from a Geological and Chemical point of view) Bright Spots located in the proximities of the center of Occator Crater. They are all shown here in Absolute Natural Colors. Even in this case, the yellowish Areas - extremely well visible right on top and around of the Bright Spots - are still a mistery. 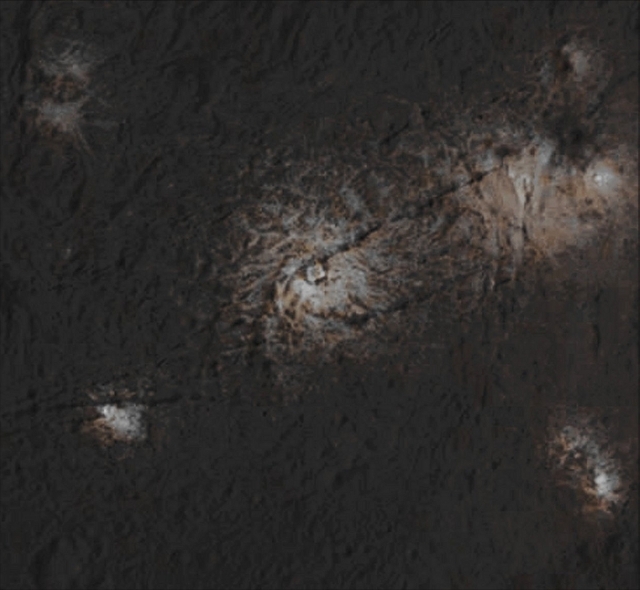 Such kind of views can (also/among other things) be used to highlight subtle color differences of 1-Ceres' Surface. However, the - apparently (of course in our humble opinion, as IPF) - continuous modifications, in shape, morphology and consistency, of the aforementioned White Spots, is another mistery of this - always - fascinating, and truly hard to understand, so-called "Dwarf-Planet". Soon, we, as IPF, shall be able to suggest a plausible (and humble) explanation of these unbelievable Surface Features. This frame (which is another sub-crop obtained from an Original NASA - Dawn Spacecraft's falsely colored and NON Map-Projected image-mosaic published on the NASA - Planetary Photojournal with the ID n. PIA 20355) has been additionally processed, extra-magnified to aid the visibility of the details, contrast enhanced and sharpened, Gamma corrected and then re-colorized (according to an educated guess carried out by Dr Paolo C. Fienga-LXTT-IPF) in Absolute Natural Colors (such as the colors that a normal human eye would actually perceive if someone were onboard the NASA - Dawn Spacecraft and then looked ahead, towards the Surface of 1-Ceres), by using an original technique created - and, in time, dramatically improved - by the Lunar Explorer Italia Team.